The series of stories were each unique and contained within different settings. The continuous transition from one story to the next was extremely jarring and I felt like a fish flailing on land. There was so much detail and the characters were all so diverse that I felt overwhelmed…in a good way. The tales were simply bewitching and bewildering. 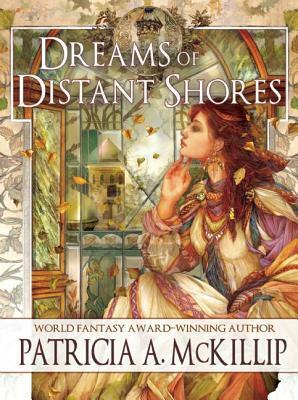 I’m a new reader to Patricia McKillip but I loved the prose and the way the writing immediately sucked me in. I liked some stories better than most and each has something that snags my attention, but I favored The Gorgon in the Cupboard. There’s just something about it that fits and connects with me since I’ve always had a fascination for the Victorian era. I left that story (and many others) wishing to know more. This was the shortest of the stories and thus does away with the formalities of introducing the characters’ names, the settings, and the conflict. It utilizes a common TV trope -in media res- with a man asking a woman what’s the weirdest thing that’s happened in her life. There are no contexts and in short, we are given no explanations. It’s a clever hook and I loved how things were left open-ended. Witches and goddesses are given a new meaning in this story. Note: By the time I started in on this story, I think I got the hang of ‘magic’ in McKillip’s mind. It’s a difficult concept to write about because it’s elusive and overridden with so many cliches. In a book, magic oftentimes must be explained and made sense of in order for readers to understand how it’s usually used to create a power struggle. However, McKillip does not manipulate the ‘magical element’ to exert power on characters. As readers, we simply observe the effects it has on people and how they react to it. The moral of this story was very realistic and the fantasy element is kept to a bare minimum. I liked the combination of Greek mythology that played into the inspirations of Victorian artists. It’s a story rife with beauty and had much more character development than any of the stories. The characters had despair, fear, and hunger who was captured so well that it’s not hard to see why it’s my favorite. Character development is always a +1 for me along with a lesson well-learned at the end. Witches in the modern-day world have animal familiars. I can’t say much about this because they live rather mundane lives as band members playing for a club. The writing is exceptional but I didn’t derive much enjoyment out of this story. I’m not sure if there was a typo because Harry, not Henry, went motoring with Edith. This seemingly innocuous trip led to a visit inside an ‘abandoned’ house. Edith and Henry appear to be fanciful people prone to a little bit of adventuring so I’m pleasantly surprised that the author delves into the multi-layered nature of a person’s life. Rational relatives deal with their old mother who they believe is going cuckoo because she’s spouting some ridiculous nonsense about aliens abducting her at some point in her life. A story steeped in reality, I can’t say that it goes hand in hand with the fantasy/sci-fi genre. These relatives take everything with a healthy dose of skepticism but in a while, they question it. The multitude of names being thrown around irritated me because many of them were never mentioned again. Taking place in a touristy beach town, the story starts out with a couple who are content with living by the sea and indulging in their hobbies. One of them loves discovering fossils while the other loves drawing the sea and everything underwater. A string of mysterious incidents and visitors leads to some turbulent upheavals in their lives. The longest of the stories, Something Rich and Strange places a heavy emphasis on the ecological effects of humans on the sea. It’s a very insightful writing piece and I thought the subject was handled very well along with the involvement of mermaids that played into it. The two main characters were rather lackluster but they weren’t meant to be drawn out as magnificent protagonists. It rather underlined the moral of the story through ordinary people who share an affinity for the sea. Thank you to Tachyon Publications and to NetGalley for providing me with an advanced copy of this book in exchange for my honest review.